Welcome to challenge #100!!! 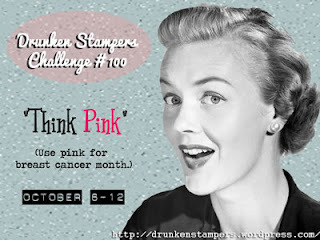 This week's challenge is "Think Pink" - your challenge is to use pink somewhere on your card for breast cancer month. Be sure to check out the Drunken Stampers Blog for all the details on this challenge and to see what the rest of Team Flirtini came up with this week. I made two versions of this card in variations of pink. The first one, I haven't used my new cardstock or ink yet in the new SU in colours Primrose Petals and Raspberry Ripple. And I added what I like to call the "Jen Hoover" flower...which is 8 scallops punched out from an old thesaurus, spritzed, wrinkled, inked then layered with a brad in the centre. So, let's see ya get yer Pink on and see what you come up with for this week's challenge! These are both so pretty and elegant! I love the different shades of pink you used. These are both beautiful. I love that sentiment, and it's perfect for Breast Cancer fighters! !